Our corp fellows recipient Reagan Wineman just put on a concert to help raise awareness about mental health and suicide prevention, and was just featured in the Santa Maria Times. 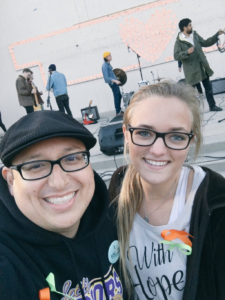 It was the tragic loss last summer of [Name removed for confidentiality], a popular Righetti High School teacher and her mentor, that inspired 16-year-old Reagan Wineman to put together a concert to raise awareness for mental health and suicide prevention. [Name removed for confidentiality], a resident of Arroyo Grande, had taught sophomore honors English and Advanced Placement Literature at Righetti High School since 2009. She died in August in Ashland, Oregon. For the last several months, Wineman, a junior at Righetti, has been meticulously planning the Concert 4 Life set for 5 to 7:30 p.m. Sunday in the on-campus Greek Theater. The concert itself is to not only commemorate those whose lives were lost to suicide, but also to allow community members afflicted with mental health issues and battling depression to receive the help they need, she said. The lineup for the free concert includes The Royal Suns, Pancho and the Wizards and King Cole, who will perform half-hour sets. Between each set, various speakers and counselors will present resources available at the school for those who need help. A variety of booths will be set up at the concert by local government agencies and nonprofit organizations, including the Santa Barbara County Sheriff’s Department, National Alliance on Mental Illness and Transitions – Mental Health Association. The school’s To Write Love on Her Arms organization will hand out water and sell bracelets, and the FFA program will sell tri-tip sandwiches. The origin of the concert can be traced to Wineman’s trip to the National Teen Leadership Program conference in Sacramento last summer. [Name removed for confidently] was the one who sent Wineman and funded her trip. Wineman was selected to attend the conference and represent a school from the Southern California region in addition to submitting a community project for the NTLPCorps Fellows Program scholarship. “The conference changed me,” Wineman said. As part of the scholarship program, students submitted projects created under the guidance of advisers and mentors who helped complete them. The program gave students the opportunity to integrate skills learned from the leadership program and use them to create a service project that would directly impact their communities. Wineman said she set her sights on something she knew affected many people in her life – suicide and mental illness. It was her Concert 4 Life project that helped her be one of the two students who won the NTLPCorps Fellows scholarship.